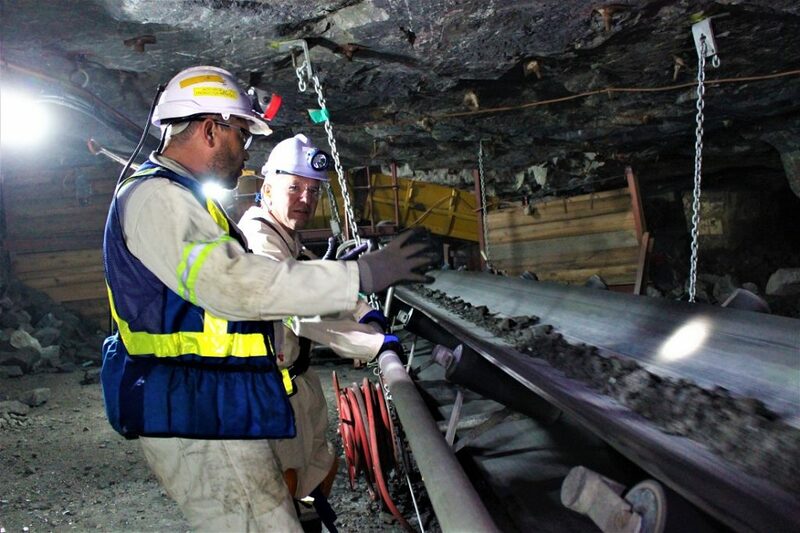 Sibanye-Stillwater’s Bathopele Mine is one of the highlights in the South African platinum sector, writes Leon Louw, who visited the mine recently. There are six working sections on the East Shaft. One section consists of 10–12 panels and the panel widths are between nine and ten metres wide. Although South Africa hosts the biggest platinum group metal (PGM) deposits on earth, it is not always an easy task getting it to surface. Most of the country’s platinum mines are renowned for their difficult working conditions. 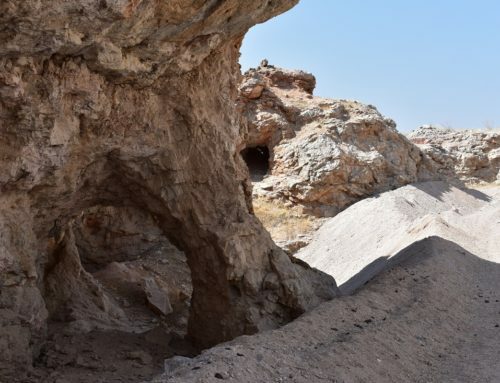 Narrow veins, uneven surfaces, tricky geology, and at times atrocious ground conditions, await miners as they venture into the marrow of the Bushveld Igneous Complex, a geological phenomenon if ever there was one. However, Sibanye-Stillwater’s Bathopele Mine, close to Rustenburg in the North West Province, is an exception. 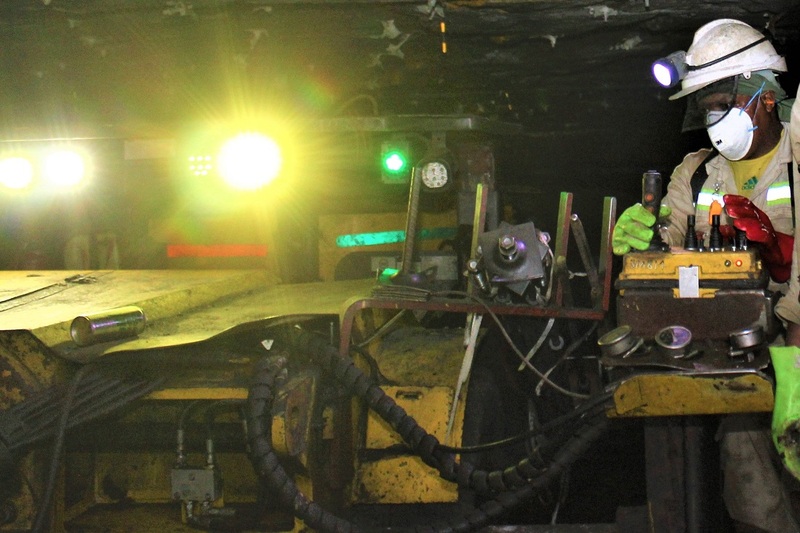 The mine is fully mechanised, and it is arguably the most advanced platinum mine in the industry. 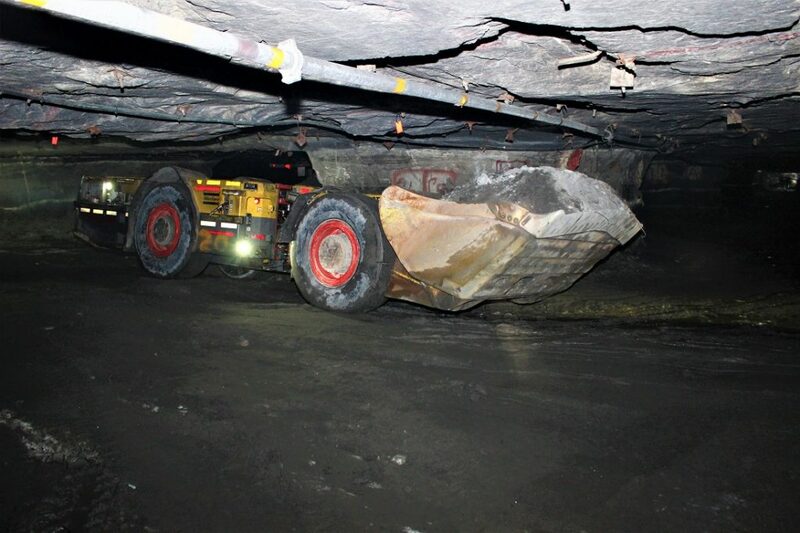 To enter an underground platinum mine with a shuttle car via a decline shaft compared to descending a 3km-deep gold mine in an overcrowded cage, is like comparing first class with economy class. Although the drive down Bathopele’s shaft could be regarded as luxurious in terms of accessing underground mines, it is still an experience worth remembering. To lie on your back, caged in next to two colleagues, watching the hanging wall flash by millimetres from your nose and from the front end of your hard hat, makes for an exhilarating adventure. The rumble of a powerful diesel engine descending a steep slope, and its distinct fumes, clogs your ability to comprehend the intricate geology of the Bushveld Igneous Complex, even while you are staring at it. 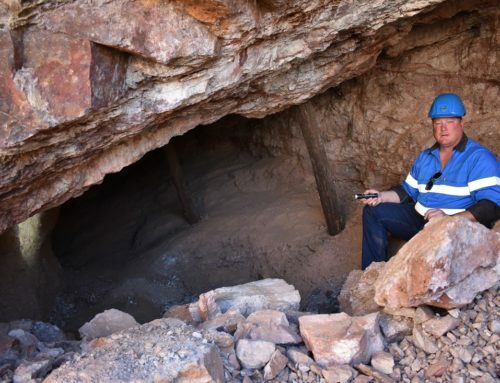 Trying to find the best position to negotiate the bumps, and at the same time attempting not to bump your head in the process, is the best way to describe the state of affairs on the way to chief mine overseer Herman Steyn’s Section 10E, in East Shaft. Sibanye-Stillwater’s management team will be familiar with this conundrum as the number of challenges that now confront this mining giant mounts, but at the same time, more opportunities present itself. Nevertheless, Sibanye-Stillwater has done a sterling job at Bathopele since taking over the operation from Anglo Platinum (AngloPlat). Bathopele forms part of what was once AngloPlats’ Rustenburg operations. Sibanye-Stillwater acquired the Rustenburg mines from AngloPlats in 2016 in a deal worth more than R4.5-billion. The Rustenburg operations are north-east of Rustenburg and Kroondal, 123km west of Pretoria, and just more than 150km north-west of Johannesburg. The lease area covers about 360km² (30km from east to west and 12km from north to south). The Rustenburg complex consists of three operating vertical shafts: Siphumelele, Khuseleka and Thembelani, which use conventional mining methods, and Bathopele, which is a mechanised operation. Bathopele started producing PGMs in late 2000. 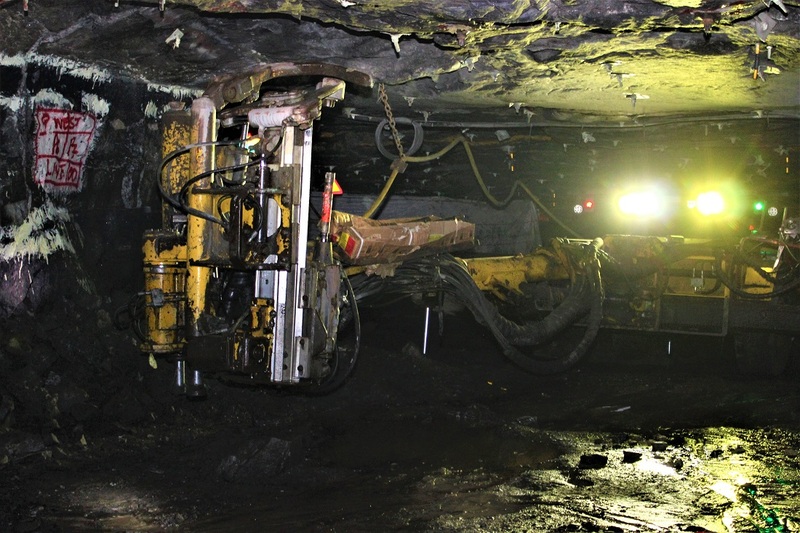 In each section of the mine, two LHDs are used to clean the stopes. 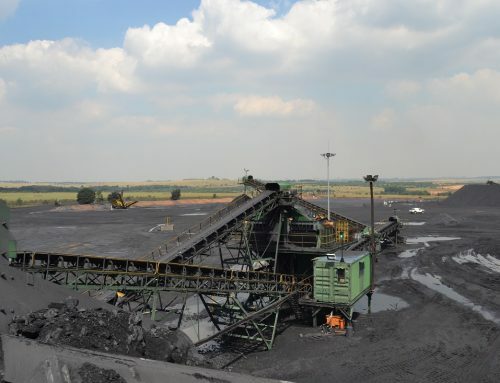 The two conveyor belts, which run parallel to the decline shafts at Sibanye’s Bathopele Mine, take the ore to surface. 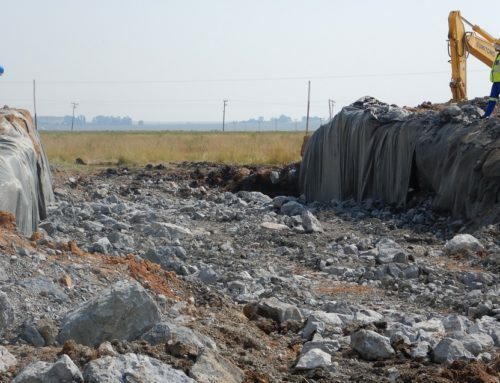 At a time when the mining industry is desperately trying to modernise, Bathopele is a good case study of a mechanised platinum mine, which many pundits believe is not possible in South Africa, considering the geology, ground conditions, and narrow veins. 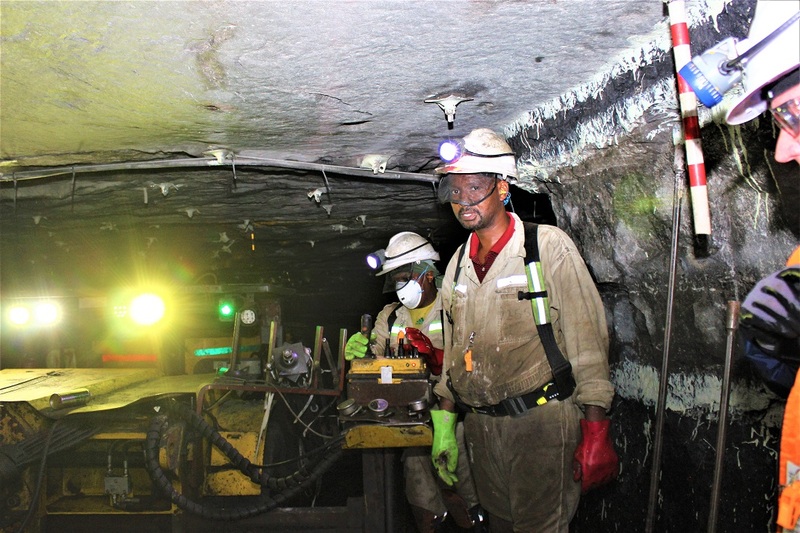 The mechanised operation at Bathopele, however, has proven that it is safer, and materially more productive, than conventional, labour-intensive mining. 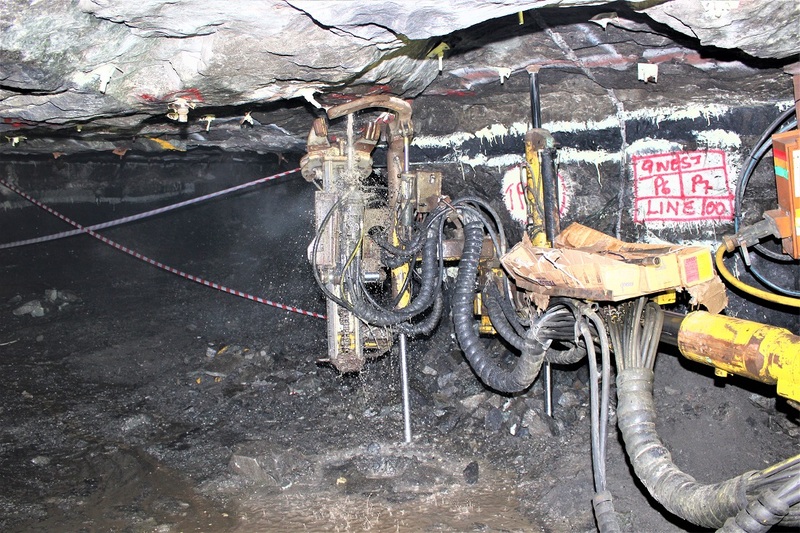 According to Jaco Grobler, vice-president mining at Bathopele, there has been no serious injuries at the mine this year. 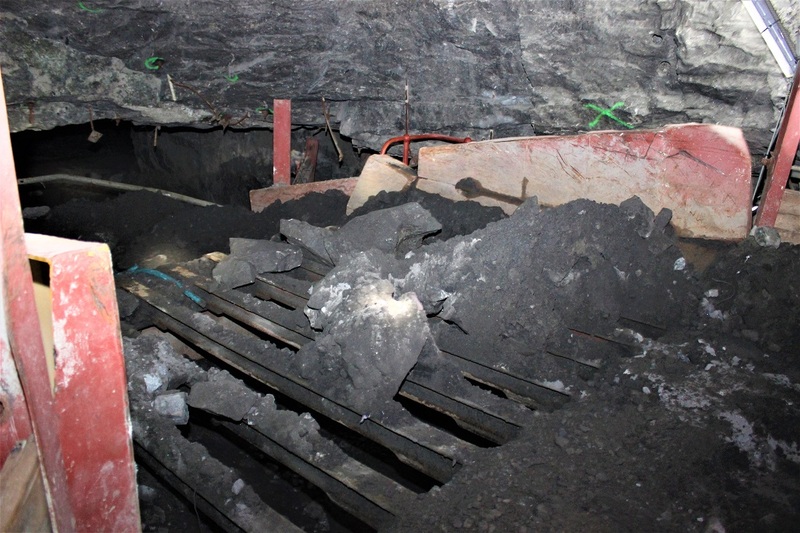 “Our focus has been on slip and fall, which has, in the past, caused the most accidents in the mine,” says Grobler. “Our first line of defense was to get the shift supervisors or shift bosses on the working face to make sure people comply with our safety standards. We also provided all workers with a whistle, which is compulsory to carry, and in any unsafe situation, the workers can blow the whistle,” Grobler adds. 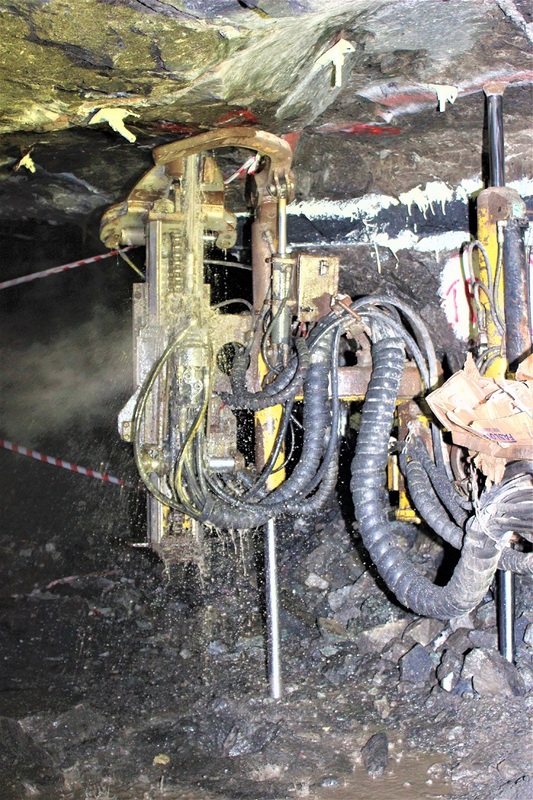 In a mechanised operation like Bathopele, with a substantially smaller group of underground workers than in a traditional mining environment, the agents of accidents are slightly different. Factors like trackless mobile machinery, fall of ground, and conveyor belts need to be monitored more closely to prevent serious injuries and fatalities. 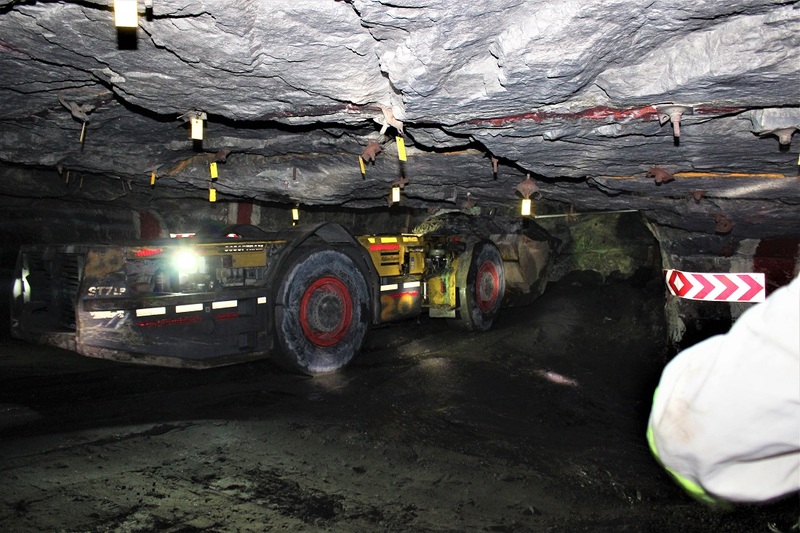 Apart from the safety benefits, Dawie van Aswegen, head of mining: SA PGM operations at Sibanye-Stillwater, says that mechanised operations are much more productive, but it can have its own challenges. To convert a conventional mine into a mechanised operation is not easy, but it is something that Bathopele didn’t have to deal with. Sibanye-Stillwater does, however, operate other conventional shafts in the area that could be converted, but it is probably not viable. “To operate a trackless fleet where there is a conventional infrastructure remains difficult,” says Van Aswegen. All Sibanye-Stillwater’s trackless mines in the area are board-and-pillar operations, not more than 600m deep. Converting conventional mines will entail implementing a similar method, which will require leaving massive pillars as support, while the extraction ratios will decrease. Sibanye-Stillwater operates three conventional shafts in the Rustenburg area — Siphumelele, Khuseleka, and Thembelani — and six trackless shafts, namely Kwezi, K6, Bathopele, Kopaneng, Simunye, and Bambanani. Van Aswegen says the trackless shafts together produce close to 900 000 tonnes of PGMs per month (tpm), while about 300 000tpm are brought to surface from the three conventional shafts. All the mechanised shafts are mining the UG2 reef, while the conventional mines target both the UG2 and the Merensky reefs. 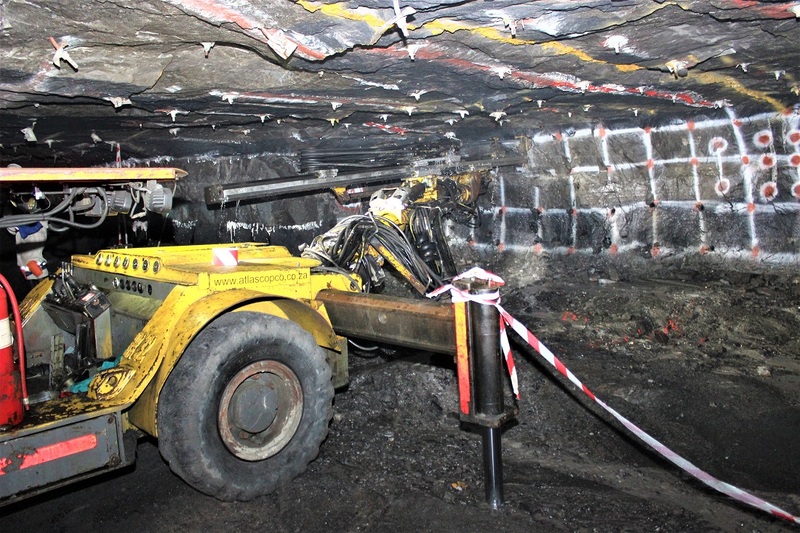 Atlas Copco supplies most of the underground equipment. Bathopele has a vibrating feeder grizzly on its tip with an aperture of about 30cm. The LHD dumps the material after a blast, and the fines (referred to as ‘stof’), which is normally the reef, will fall through the grizzly onto the pan, while the big rocks (the waste) will remain on the grizzly. Sibanye-Stillwater’s Rustenburg operations are on the southern side of the western limb of the Bushveld Igneous Complex. The average reef width is extremely narrow in these areas and varies between 70cm and 90cm on UG reef mines, while Merensky Reef varies between 20cm and 50cm (the company mines both UG2 and Merensky reefs). The reefs dip from south to north at a constant nine degrees. To the east of Sibanye-Stillwater’s operations lies Lonmin’s shafts, which is Sibanye-Stillwater’s most recently proposed acquisition, and the company may soon take over the operations (subject to various outstanding conditions), which of course includes infamous Marikana. 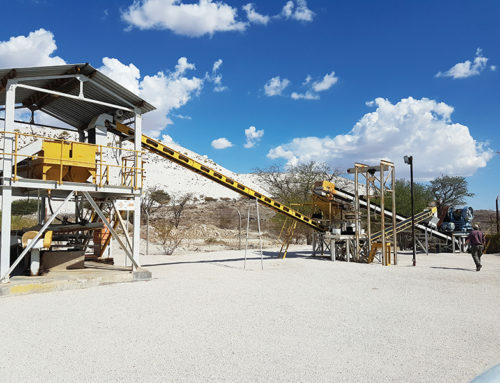 To the west of Sibanye-Stillwater’s current operations is the other big name in South African platinum producers, namely Impala and Royal Bafokeng’s Rasimone Mine. 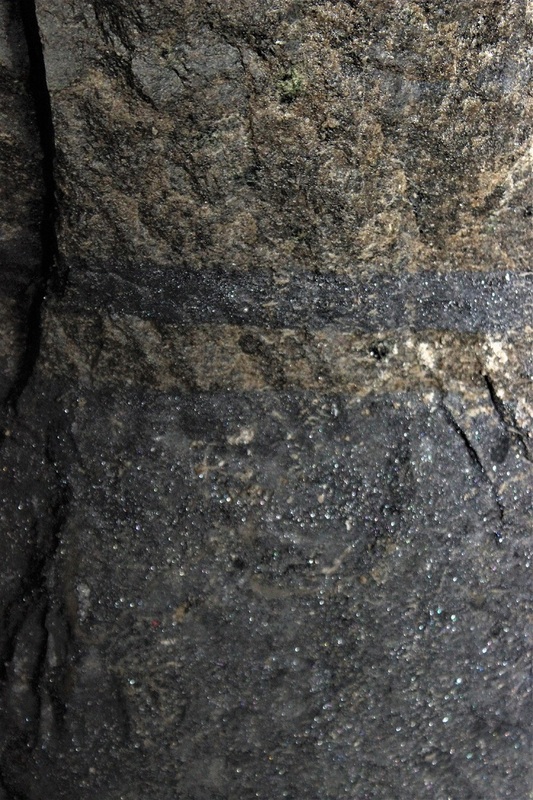 The rich ore body at Bathopele is accessed by two decline shafts: East Shaft and Central Shaft. Two decline conveyor belts run parallel to the shafts, all the way to the bottom, where it reaches a depth of about 600m. Bathopele’s two shafts are completely mechanised. Mechanised mines have significantly reduced the number of workers employed in underground platinum operations. The East Shaft of this fully mechanised low-profile board-and-pillar operation mines a single seam of UG2 Reef at an average of about 1.95m stoping width (in some cases the UG2 Reef can be as narrow as 80cm). The teams in the Central Shaft operate in stoping widths of about 2.2m on average and they mine dual seams of UG2 Main and Leader reefs. Van Aswegen explains there is a waste portion of about 1.3m between the two seams; therefore, they take out both seams. “If the internal waste portion falls below 1.3m, we struggle to keep it up with support and as a safety precaution, we mine both reefs,” he explains. 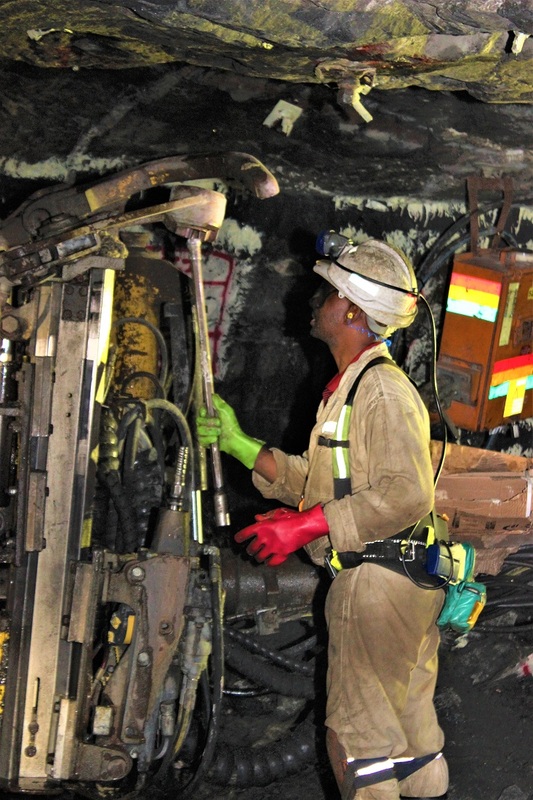 Each underground section at Bathopele consists of 27 (nine per shift) workers rotating on three shifts. Each shift works 11.5 hours on a two-shift cycle. The morning shift starts a six o’clock in the morning to half past five in the afternoon, and the next shift works from six at night to half past five in the morning. The nine workers of the third shift are off duty for a week. Each underground crew covers about 2 250m and the targets for the different teams are to install seven roof bolts per hour and drill 20 holes per drilling rig, while the LHDs have to move 10 loads of ore per hour. 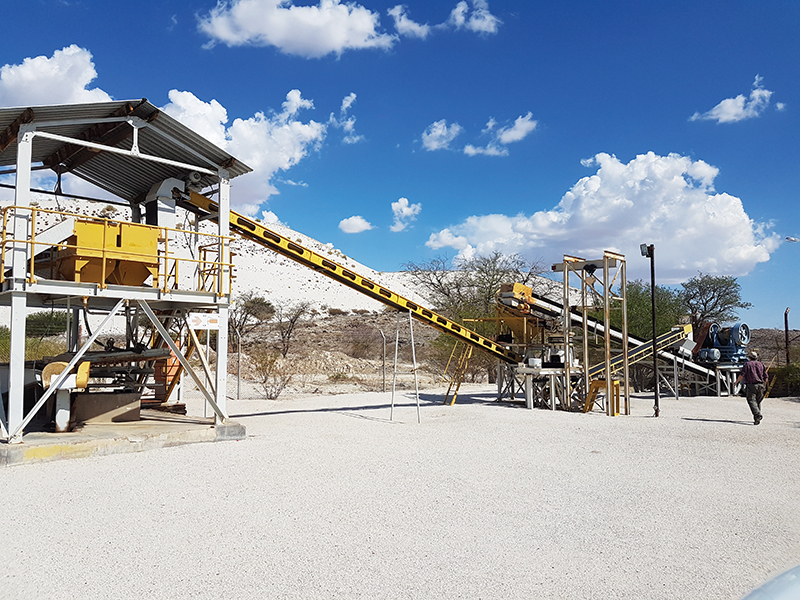 To prevent bottlenecks at the processing plant, Van Aswegen says the mine has minimised its underground waste and sends as little waste as possible to surface. “When we encounter a geological feature that results in off-reef mining, we pack the waste underground in the worked-out areas and we don’t send it to the concentrators. In addition, we have re-engineered the tips and we scalp about 7% of the tonnes that we break off the grizzlies. These scalping tonnes are also packed in the worked-out areas,” Van Aswegen adds. Operating mechanised equipment has introduced a new set of skills to mine workers. 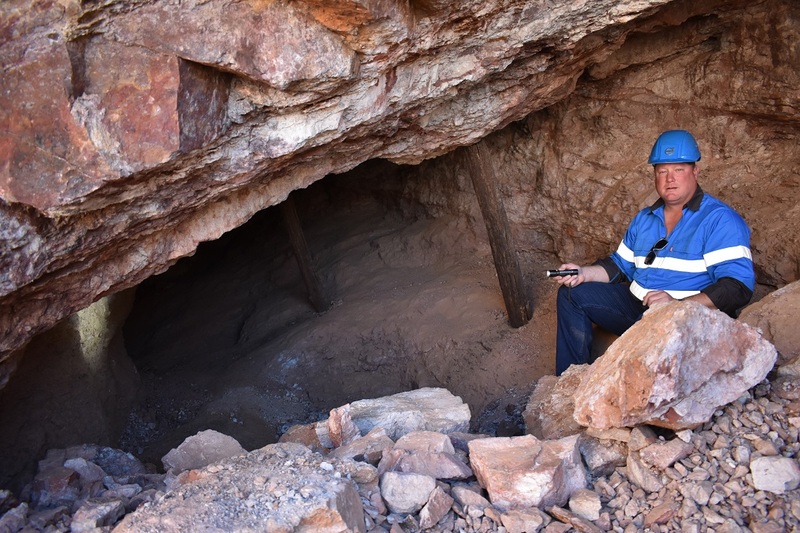 “There are eight working sections and a development section on the East Shaft,” says Steyn in a crouched position at his workstation, 300m underground. One section consists of 10–12 panels and the panel widths are 10m wide. “However, we can mine it smaller up to 6m wide, depending on the ground conditions,” says Steyn as the noise from the LHDs dies down. Every section has its own conveyor belt that links with the main belt to the surface. In other words, the conveyor belt is moved as the miners advance and is normally not further than 100m from the face. “In this section, there will typically be one mechanised drill rig that is able to drill a hole end of 3.2m. On average, we achieve an advance of about 3.0m,” explains Steyn. In addition, each section has two roof bolters that install the primary support of 1.6m fully column Resinbolt. According to Van Aswegen, these roof bolters have been modified to enable them to insert long anchors up to 3m as secondary support. There are two LHDs in each section. Steyn says the target is to blast two panels per shift, clean two panels per shift, support two panels per shift, and prepare two panels per shift. “That is our typical cycle,” says Steyn. 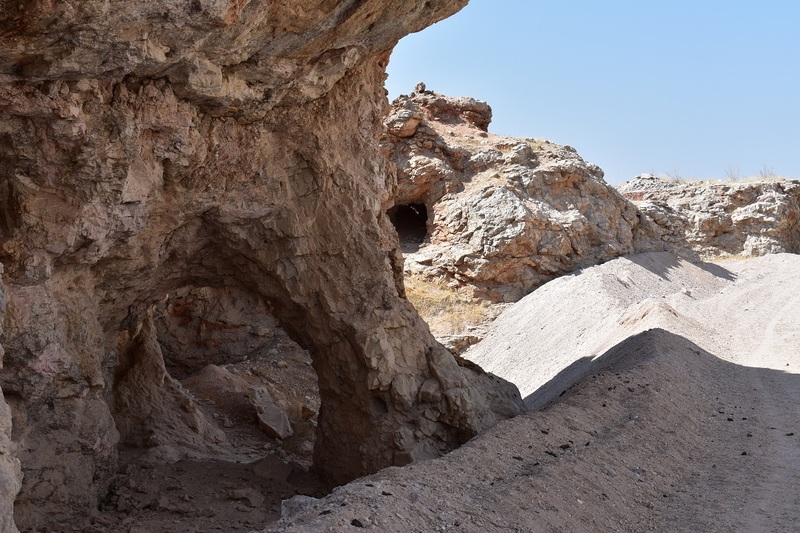 Steyn showed Mining Mirror the big rocks in the worked-out areas to which Van Aswegen alluded to before. This is part of the strategy to reduce waste. “We have a vibrating feeder grizzly on our tip with an aperture of about 30cm. The LHD will dump its load after the blast, and the fines (referred to as ‘stof), which is normally the reef, will fall through the grizzly onto the pan, while the big rocks (the waste) will remain on the grizzly. We then just push these rocks off the grizzly and pack it in the worked-out areas again. About 7% of all the waste that we create is repacked,” says Steyn. The pillars in Bathopele’s East Shaft constitute about 19% of the mine infrastructure, while the mining losses equate to about 16%. East Shaft’s extraction ratio is approximately 65%. “Mining losses are caused by potholes, dykes, and geological features. In these areas we have to increase the size of the pillars to ensure stability,” explains Van Aswegen. Section 10E of Bathopele is about halfway between the top and bottom boundaries of East Shaft, and between 280m and 300m vertically underground. One has to travel about 1.2km in the back of a personnel carrier to reach Steyn’s section. The bottom of the shaft is another 300m beneath Steyn’s section. For support, the crew uses 1.6m-long roof bolts as primary support, and 3m coupling bolts are installed as secondary support in areas deemed necessary by the rock engineer modelling. “Before a blast, we drill a 3.2m hole with an Atlas Copco Jumbo rig. In this section, a six-ton Atlas Copco LHD and another Atlas Copco with a seven-ton bucket are used to clean the panels. We tip onto a strike belt and from there onto a dip belt. Before it reaches the decline belt in the shaft, the ore is tipped onto three more conveyor belts. 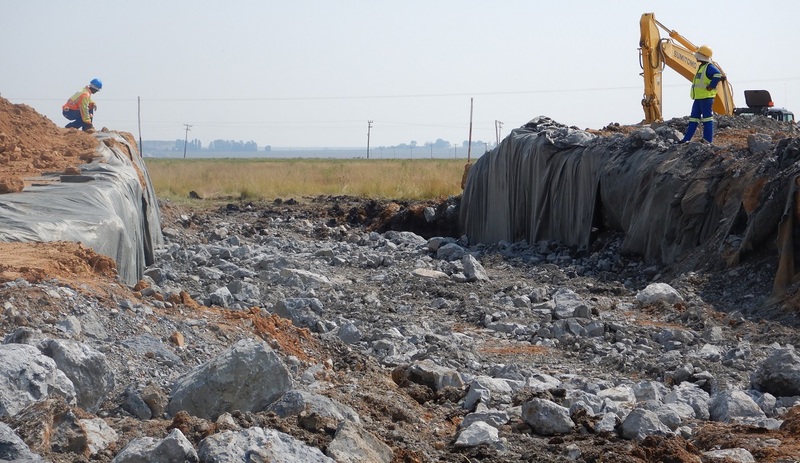 The decline belt dispatches of it on surface, where it tips into a surface silo from where it is transported with a surface belt directly to the Rustenburg UG2 Concentrator,” says Steyn. On a normal day without interruptions and with 80% availability, the rigs drill about 20m, or two panels. Steyn and his team are doing three panels at the moment. “When we don’t have any interruptions, we can drill more than 20m,” says Steyn. For support, the crew uses 1.6m-long roof bolts and 3m-long coupling bolts. The reefs in Bathopele Central Shaft. 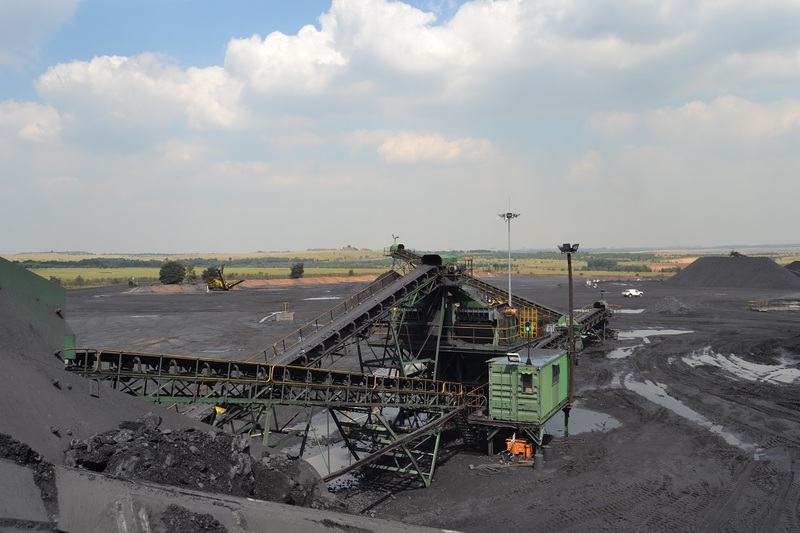 Bathopele’s ore is processed at the Rustenburg UG2 Concentrator, which has a capacity of about 450 000tpm. The plant was commissioned in 2002, and according to Seabelo Ratau, plant manager UG2 Concentrator, it employs 170 permanent employees and close to 150 contractors. The plant is a mill-float circuit with a primary mill and a secondary mill. “UG2 receives ore from the conventional and mechanised shafts in and around Rustenburg and we store the ore in our silos before processing. About 60% of the run-of-mine is Bathopele product, the other 40% is railed from the other Rustenburg operations,” says Ratau. The plant’s primary ball mill grinds at a feeding rate of about 750 tonnes per hour, and both the primary and secondary mill operate at 9MW. The plant consists of 44 Autotech float cells, a primary rougher, a secondary rougher, a primary cleaner and a secondary cleaner, and then the final stages of the float cells, which are the re-cleaners. “The product from our operation is pumped to the neighbouring plant called the retro-feed plant and from there, the concentrate is pumped to the Waterval smelter for further smelting,” Ratau explains. “We also have an inter-stage chrome plant, meaning our rougher tail goes through the chrome plant scavenging the chrome and from there it returns to the operation,” Ratau adds. Bathopele certainly has its challenges, but its operations are in good hands. In a depressed market and a troubled sector, the mine is most definitely one of the brightest lights.